It's Earth, but far, far, far into the future. 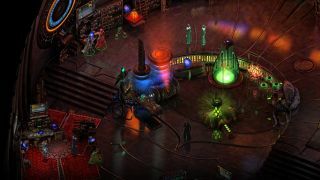 Well here it is: the trailer that explains the setting of Torment: Tides of Numenara, while offering some intriguing hints of the locations, people and stories we're going to encounter in inXile's isometric RPG. Of course, there's a good chance you're exploring that setting already via the Early Access release, but for those of us that would rather wait for the finished game, the following video offers a nice summary of what Numenara is all about. Torment takes place in the Ninth World, as you can see, that world being Earth one billion years from now. Quite a lot has changed in the last few years: Mrs Jones from next door has morphed into a big sentient crystal thingy, while cousin Bill's Honda Civic has been upgraded to a Da Vinci-style rickety wooden aircraft. Also, that person has a quest that encompasses multiple universes, and there's a dungeon that exists in your own head.